PSU and Ethernet adaptor missing. Without a PSU we are unable to test this. The unit was purchased for a project but another SA1110 board came the original owners way before they needed to use it so it is unused and untested. It seems to be complete apart from the PSU and CF - Ethernet adaptor which are missing. The optional companion SA-1111 which adds extra IO is not included. 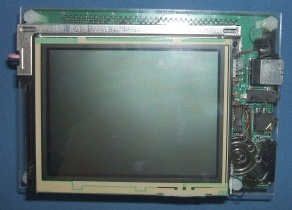 This SA-1110 Development Board is shipped with many hardcopy documents, including Readme files and Hardware Release Notes (this document). The Readme files and Hardware Release Notes contain last minute changes which are not documented anywhere else. 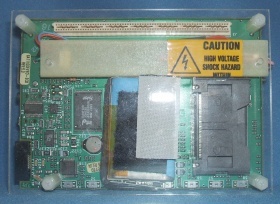 The following components are very fragile on the SA-1110 Development Board. If these components are damaged, the board or unit will need to be replaced. - 140 pin connectors--very fragile, see documentation. - Display ribbon for J9--the ears are easily damaged. The power input socket is smaller than a DC 2.1mm (we think it is 0.7x2.35mm). The purchaser may have to bypass the socket and find somewhere to solder power to! Quick Start User's Guide -- Not available at the printing of this document; check Intel's website for developers for new documentation. 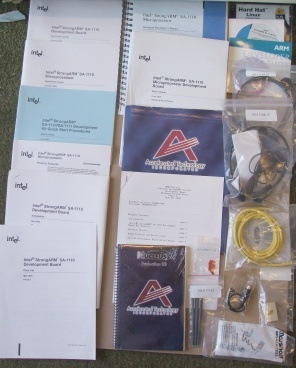 Note: The schematics, parts list, software (including the CPLD source code) and copies of the documentation are available from the developer's area on the Intel website. Estimate 100 page ring bound book with CD? Price: £299.00 no VAT to pay!